"The versatile Bridgetown Backless Dress or Tunic is great for fluid knit or woven fabrics with some drape. The open back is stunning for an evening look with a pair of heels or dress it down with a camisole underneath or over a pair of jeans for a more modest look. The simple styling makes it quick and easy to sew. It features a loose fitting bodice with drop shoulder short sleeves, an elasticized waist, and a jewel front neckline that becomes a cross over draped open back. Dress A and Tunic B have a bottom band and Dress C and Tunic D have standard turned up hems that are more suitable for knits. The dress hems land above the knees and the Tunics land at the mid-thigh. 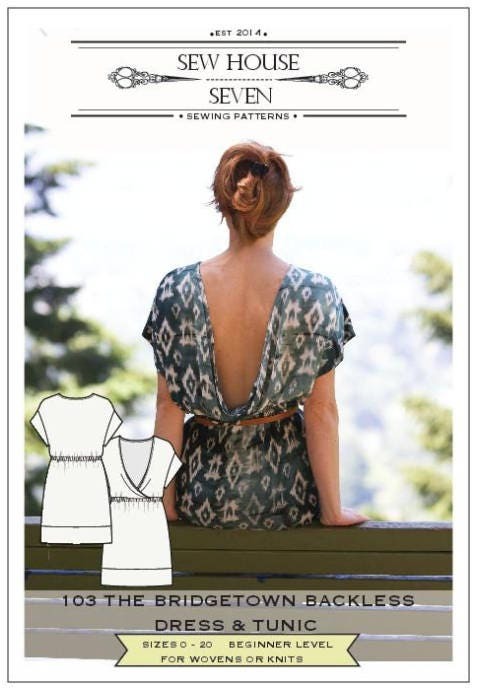 You may want to think about sizing down when sewing with knit fabric. This is a beginner level pattern. Sizes 0 - 20"